Has Sony made the ultimate 50mm prime lens? Sony is pulling out all the stops in its quest for image quality. The full-frame sensor in its mirrorless Alpha A7R II is one the best in the world, and Sony aims to match it with some of the world's best lenses. 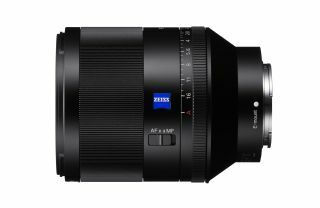 The new Zeiss 50mm f/1.4 might look an odd choice, though, given that the range already includes a Sony 50mm f/1.8 and a Zeiss 55mm f/1.8. Zeiss and Sony, in case you're wondering, have been collaborating in lens design and manufacture for 20 years, and Zeiss lenses for Sony cameras can be considered part of the Sony stable, sitting alongside Sony's own, cheaper lenses and, more recently, its top-end G-Master optics. The new lens is big, bold and beautiful, though with lenses this big, you have to wonder why Sony puts so much effort into making its A7-series bodies so small. The new 50mm lens comes with ring-drive SSM (supersonic motor) autofocus for speed, responsiveness and silent operation – vital for movies – and a traditional aperture ring, with an A setting for automatic aperture control and click-stops for manual aperture settings. And if you're shooting video rather than stills, you can switch off the 'click' for smooth, silent aperture adjustment while filming. The optical design includes Advanced Aspherical (AA) and Extra-low Dispersion (ED) lens elements to reduce spherical and chromatic aberration, and Zeiss's own T* lens coating to control flare and ghosting. Zeiss and Sony are going for the best-quality background 'bokeh' in defocused areas by incorporating an 11-bladed aperture mechanism. Our early sample shots suggest the Zeiss 50mm is super sharp and contrasty, even wide open at f/1.4. The performance needs to be good, though, because the Zeiss Planar 50mm f/1.4 is going on sale at a jaw-dropping £1,500 at a date yet to be announced. Sony also took the opportunity to confirm pricing for its new 70-200mm f/2.8 telephoto, announced earlier this year, but only now becoming available. It will sell at a recommended retail price of £2,500, which pitches it well above comparable 70-200mm f/2.8 DSLR lenses from Canon and Nikon. Sony is clearly aiming for the optical high ground here, so we look forward to running these lenses through our battery of lens tests to see if they really do raise the bar for the rest. Not content with boosting its full-frame E-mount lens range, Sony has also announced a new wireless flash system consisting of a £350 FA WRC1M wireless commander unit and £200 FA-WRR1 receivers. These use radio signals to offer a range of up to 30m and allow the control of multiple flash units organised into groups and simultaneous control of several cameras.